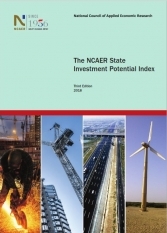 NCAER-State Investment Potential Index or N-SIPI is an evidence-based index that combines published secondary data on key relevant parameters with an extensive industry survey conducted by NCAER across twenty states and the Union Territory of Delhi. The Index is designed to provide a systematic and reliable “go-to” reference for policy makers, existing businesses and potential domestic and overseas investors. N-SIPI 2018 ranks the competitiveness of Indian states on six pillars: land, labour, infrastructure, economic climate, political stability and governance, and business perceptions. These six pillars are classified under four broad categories: factor driven (land and labour), efficiency driven (infrastructure), growth driven (economic climate and political stability and governance), and perceptions driven (ranking of business climate built on firm surveys). A unique feature of the N-SIPI index is the integration of industry perceptions of the investment potential and business climate of a state along with the fundamentals likely to drive investment decisions in that state. Another unique feature of the 2018 N-SIPI is the inclusion of GST specific questions in the survey questionnaire for the perception pillar of the index. Delhi tops the N-SIPI 2018 rankings, followed by Tamil Nadu, Gujrat, Haryana and Maharashtra.